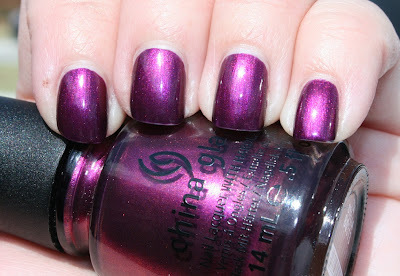 Today I'm wearing another gorgeous purple shade from China Glaze that Beauty Stop Online sent me to review. Beauty Stop Online offers China Glaze for just $2.99. This is a red-based purple with red and violet microglitter and may just be my favorite of the four purples they sent me. More info: Stella is part of the Retro Diva collection that was released in 2009. I love the Let's Groove color!